Fuel cards for small business are similar to any other credit cards and are used to conveniently make cash free transactions for purchasing fuel at a gas station. It is common to use fuel cards for business in organisations where processes heavily rely on transportation and fleet management. Beside many other benefits, fuel card services are handy for tracking consumption and expenses, which are some of the main reasons for companies choosing to use them. Just like any other conventionally used credit card, a fuel card for business needs to be swiped for a user to enter the PIN code and complete the transaction. Many different fuel card companies exist, which offer packages based on one’s needs. This may include using a certain network of gas stations or having access to a variety of networks. Usually, this decision is based on the size of a company and complexity of activities. Why should I get a fuel card? Who are fuel card providers? Are there any fuel card fees? How to purchase a fuel card? What is future fuel card model? International: Some companies offer cards which can be used abroad via third party agreements. Such networks allow customers to refuel at automatic fuel pumps. It is highly advantageous in order to reduce the miscommunication due to language barrier in other counties and still utilise the benefits that fuel card services provide. Bunkered: These business fuel card providers aim to reserve fuel in order to offer a discounted price on a specific gas station network. Customer saves money even if the market price goes up. Retail: These cards provide customers the option of drawing fuel from almost any gas station nationwide. Although, the price of the retail fuel cards is relatively more expensive than bunkered cards can offer. Company: Most fleet businesses use this type fuel cards because their daily operations rely on transportation. This is especially relevant to fleet management companies. Even the smallest price fluctuations may drastically affect financial balances. All companies which can offer fuel card management services have a certain variety of benefits for business customers to enjoy. Each of these advantages also help to reflect and evaluate their importance in the perspective of business needs. Although it is rather common and relevant for customers to think about the differences between a fuel card and a credit card, which makes them doubt with this choice. Managers would agree that having at least some flexibility makes a huge impact to successful processes. Several providers of fuel card services come with an option of customisation. Assigning a customer service employee to work with the same companies every time serves the purpose of adjusting to various business needs if necessary. With such fuel card management services it is no longer necessary for drivers to collect receipts or have many different invoices for administrative handling. The fuel card companies send only one invoice with the summarised fueling history. This may be once per week or per month, depending on the package at hand. Saving on any given costs can often be categorised as one of the priorities in any given business. These cards provide fuel at the lower than the any given retail price. Such savings can range between 1 to 10 pence per liter. Especially companies with large number of vehicles on their fleet are able to highly benefit from these discounts and save a lot on fuelling costs in the long run. All the necessary information, such as fuel filling history and prices, are easily accessible via a single platform online. As a result a lot of time and efforts are saved due to reduction of bureaucratic steps that fleet managers and accounting department need to take in order to retrieve the most relevant data. A few of extra functions are available at an arm’s length, which can be added in order to improve the process management. Such features as having a top number of transactions or amount of fuel per week are available with modern fuel cards available on the market. Also a bit more sophisticated functional systems are installed for customer convenience and safety. A database with driver fuelling patterns and fraud alerts by SMS or email are also available along with the best fuel cards for business customers. Another great thing about fuel cards that no cash or actual credit card transactions are involved. This is based on Pin code and chip technology encouraging drivers not to carry significant amounts of money along with them. It drastically reduces the potentially risky situations. It also becomes a lot more difficult to commit any fraudulent activity. Nevertheless, if it happens then the record will be made anyway and will be a lot easily trackable. Due to the fact that every card is registered to a certain driver or vehicle it is manageable to follow the regular patterns and compare them to database averages. Anything that stands out from that can be immediately spot and responsible people alerted by a text message or email. Last but definitely not least is that company managers have the opportunity to have personalised reports. This is done by setting up each driver’s account separately and implementing the central control by a fleet manager. This enables closer monitoring of driver’s habits, fuel consumption and costs. Additionally, the higher the control the lesser the chances are that there will be any unauthorised purchases. This also helps to restrict employees to fuel purchases only if a need should occur. Due to the fact that there are a lot of fuel card companies, it is possible to split them into two broad groups: independent and branded. 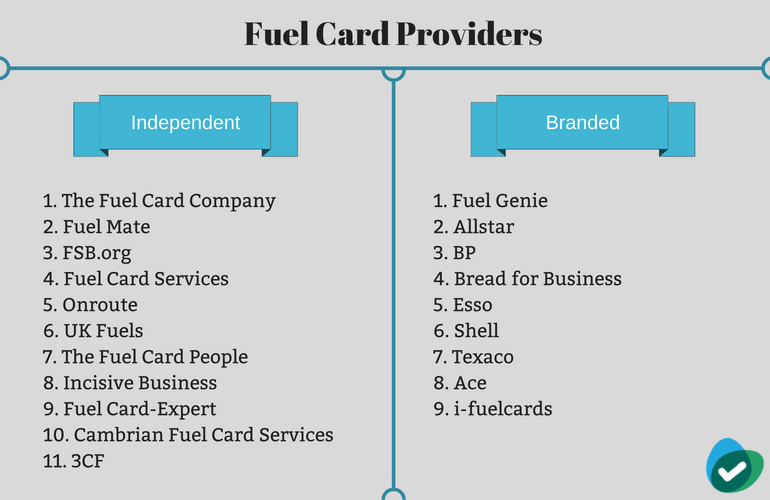 The initial difference is that independent fuel card companies offer a range of different cards regardless of their brand. Branded, also known as bunkered, providers promote the cards that can be used only within their own network of petrol stations. Just like there is no single correct way to deal with business decisions, a choice of the fuel cards for business can also depend on various factors. This may include such things as organisational processes, its fleet and specific consumption patterns. Fuel cards for small business are mainly the same and have similar benefits. Below, a list of the main fuel card companies is provided, which operate in UK and a few of them are also functional internationally. This service is made for providing valuable and unbiased information to the users, and not to promote some specific supplier. The use of providers in the content does not imply our collaboration with them or their services. Some of the best fuel card suppliers are available on the UK market, and have many similar perks for customers. Due to the high number of options it is important to evaluate the most crucial aspects of a business that a fuel card needs to support. These factors mainly depend on the scale of business. If the company is dispersed and even has international transportation needs then, naturally, a customer would rather pick a card that maintains the cross network services. Simply speaking it increases the flexibility for both drivers and managers. Drivers will have a lot more confidence on the road by not having to search for a specific network in order to refuel a vehicle. Another example is related to invoicing options. It is possible to have a bill weekly, monthly or quarterly. Depending on firm’s cash flow, accounting system and administrational task handling, this should not be a major issue to decide quickly. Most of the providers have considered this as an important aspect of fleet management and is able to offer this service part of the package. Yes. Some of the companies such as 3CF, i-fuelcards, ACE or fuelGenie provide fuel card services for free, which means that they issue a card without a joining fee or a contract. Even though the service is free, they might require at least a minimum usage throughout the period of time. One of the examples could be once per month. Other UK fuel cards do have a rate for their services and the fee normally depends on several factors. For instance it can vary if a fuel card has fixed plan of payment regardless of the network or covers the price that has been agreed beforehand. Typically, the annual cost of a single fuel card ranges approximately between 6 and 25 pounds. Once the details are filled out, the rest of the process is a responsibility of the fuel card company. A customer should be contacted soon after the application with the business package proposition. Naturally, it should be adjusted in alignment to customer’s wishes and one’s business operations. Compared to the rest of the technology improvements, plastic fuel card usage still seems rather traditional, some experts even might call it left behind and old-fashioned. Matthew Grisoni, senior management executive of the CGI company, predicts the possibility of transforming the fleet fueling industry and lifting it to a whole new technological level. Suggestion is to apply already trending payment innovation and consumer technologies, which could also work and turn around the fuel card industry and their everyday usage practices. Advanced technology, such as digitally-enabled fuelling of a fleet, would bring together retailing, payments, reporting, planning and other related processes to a single integrated platform. Future fuel card technology implications would work via connection of vehicles and mobile devices. These implementations could improve communication between drivers and fleet controllers. Several additional aspects could be applied: manager broadcasting of fleet tank reminders to achieve discount levels, or vehicles being able to detect low fuel and navigate to the next closest fuel station. This new innovative transformation should undoubtedly be disruptive to the market and offer wholly new practices. Along the way this entails enhancing customer experience and satisfaction measures. It is expected to interact with customers on a more personal level by being able to give them a more personalised welcoming or offer more value-added and tailored services. Deeper understanding of industry customers also has a potential of reduced costs and fraud, due to explicit insight gathering. Among all the possible choices of the fuel card management services in the UK, it is rather difficult to make a fully informed decision and pick the one that suits your business needs the most. The process of comparison might seem overwhelming and time consuming in a busy manager’s schedule. Worry no more - Market Inspector is here to assist you. Is your business in need of more efficient fuel management solutions? Please fill in the form at the top of the page. We will provide you with up to 4 free and non-binding quotes from qualified suppliers to guide you in choosing the perfect fuel card for your company.